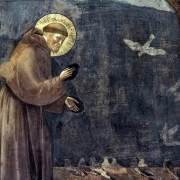 St. Francis is one of the most beloved saints. But who was he and how did he become so adored? Rev. Adam Ericksen explains Francis' radical message in his latest sermon. In this episode of the RavenCast, Dr. Jason Okrzynski and Adam Ericksen discuss how the saints can help us find friendship with God.